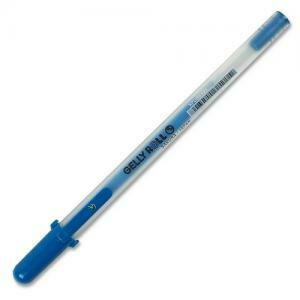 Gel ink pen features a fluorescent element making the ink glow under a black light source. Archival-quality, water-based ink is chemically stable, permanent, waterproof, and fade resistant. Ink does not smear, feather, or bleed through on most papers. 1.0mm ball delivers a consistent 0.5mm line. Pen writes on vellum (a heavy creamy colored paper resembling parchment). Ink meets ASTM and ACMI nontoxicity standards. Pen is not recommended for use on fabrics intended to be washed and not evaluated for cosmetic use on skin.